The holidays create a massive surge in advertisements and promotion from companies in all industries. The gift giving season provides great opportunity for new products to land in the hands of consumers, as a result many new fancy electronics, toys, jewelry and clothing are being shoved in our faces constantly. Rarely do you see gifts of a different variety being promoted. What I mean are gifts that can fortify you financially instead of a gadget or designer jeans. When was the last time you heard someone brag about their new bank account? Below I detail three gift alternatives you may want to consider giving and or receiving as you continue your journey on financial betterment. 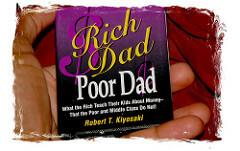 Rich Dad, Poor Dad: Arguably the greatest financial book of all time. This was the book that made it all click for me, along with thousands of others across the globe. Written by Robert Kiyosaki in the 90s. This book details a young boy who had a rich dad and a poor dad and the associated mindsets and lifestyles that led them to their current financial positions. The is a must for anyone who seeks a better financial position in their life. Open a Savings Account and Fund it: Going back to the question in the opening paragraph, have you ever heard anyone brag about the bank account they received for christmas? An even better question may be, have you ever heard of someone getting a bank account as a gift period? Most likely no. A bank account can be gifted to someone who does not have a bank account at all or maybe someone who may need an emergency, or vacation fund. Be creative with it. A funded bank account is a monetary gift and who does not like money? Gift Shares Of Stock or an Index Fund: Becoming an owner of a company sounds pretty cool doesn't it? That is essentially what owning stock is. Each share is a tiny piece of the company purchased. This is similar to opening a savings account in that you likely need to open an online brokerage account unless you hire a broker. Research the price of the stock or fund to see how much you can afford to purchase. On the day you give the gift, give the account log-in information to the recipient an voila! I hope this post planted a seed into your mind and you consider giving a gift that offers a different kind of benefit. One that can potentially last a lifetime and beyond. Happy gift giving! Newer PostBitcoin Goes Live On The Futures Market; What Does This Mean?